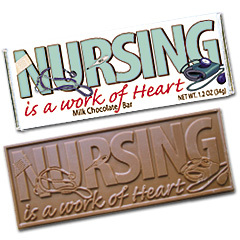 Our "Nursing is a work of Heart" themed Candy Bar is perfect for Hospitals, medical offices, rehab facilities, Visiting Nurses, or any Medical Facility. Our Nursing Chocolate Bar Wrappers are surrounded by the most delicious Belgian chocolate! The chocolate is molded exactly the way you see it here, stating "Nursing is a state of Heart" and it's the truth too! Don't you think that Nurses deserve a little Chocolate to brighten up their day? **please note that during the months of May-Sept chocolates need to ship 2 day air to prevent melting in transit. If shipping to Fl, TX, AZ or Ca will be shipped 2 day air automatically due to warm weather year round.